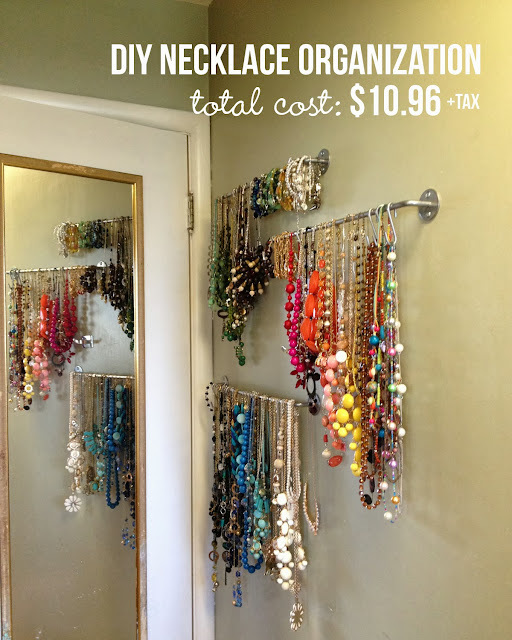 Today I want to share my new necklace organization system that is rocking the wall in my bathroom! As you can see from the photo, I have a lot of necklaces. I picked up jewelry making as a hobby a few years back and have been pretty prolific in creating my own necklaces, bracelets and earrings ever since. I'm also a bargain shopper and have found a lot of fun statement necklaces to add to my collection from Ebay and Amazon. Up until now all my necklaces used to hang on nails inside my closet above the door. This system was very flawed; the necklaces were way up high and hard to reach, not to mention hard to keep straight as I had several necklaces occupying one nail. You can imagine my dilemma in trying to organize this jewelry collecting habit of mine. I was pretty tired of the mess that my necklaces were creating, so on one of my Friday's off I pulled down all the necklaces and sorted them by color. I realized after sorting them that I wasn't inclined to put them back on the nails, so as a temporary fix I clipped them all onto hangers so they would stay untangled. My necklaces hung this way for about three weeks and during that time I racked my brain for some kind of logical solution. Then it hit me: I could employ a similar organization system (clipping the necklaces around a bar to maintain order) using the BYGEL rails from Ikea. My idea was perfect! I went to my local store (40 miles from my house) and picked up three of the short style BYGEL rails from for $2.99 each. 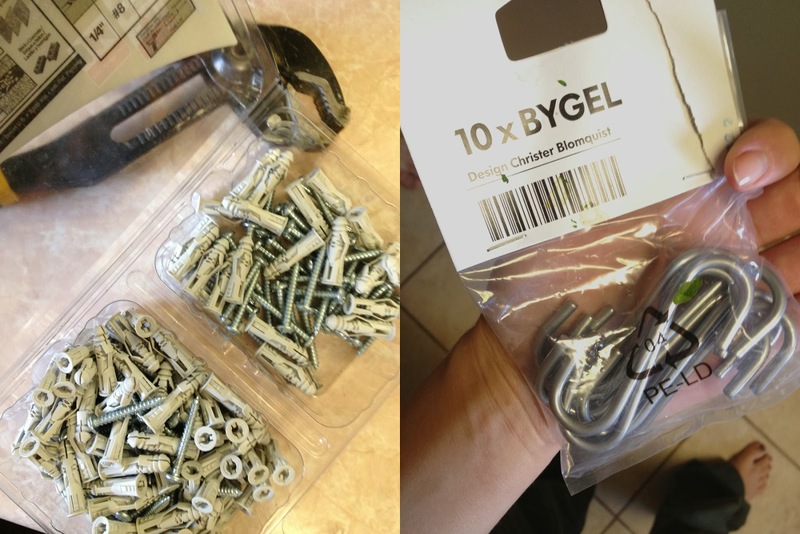 I also picked up a package of the BYGEL hooks ($0.99) as I have a few necklaces that are continuous with no clasp. The rails don't come with wall hardware, so I used some anchors and screws that we had at our house. 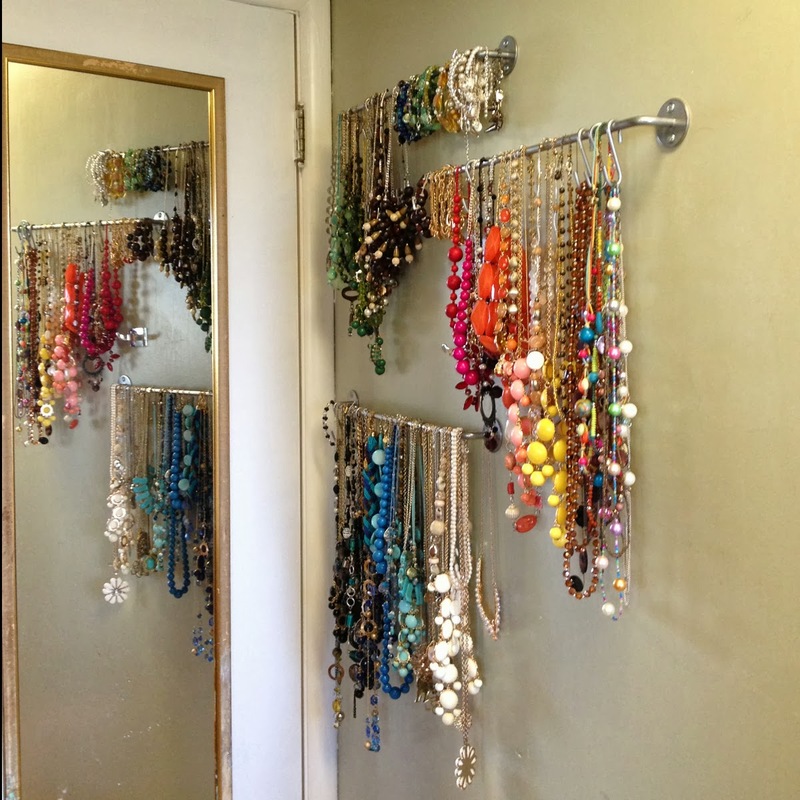 Here is the space I planned allow my necklace collection to occupy. My earring and watches/bracelets are in the bathroom cupboard, so it made sense to store my necklaces int he bathroom as well. Here's a picture of the rails before I put the necklaces on. Again, those towel hooks are not there to stay; they were just what was on the wall before the rails went up. And the finished product with all my necklaces attached. I'm in love with this system, and am soooo happy about how inexpensive it was to put together. I only spent $10.96 + tax on this whole thing. It was definitely a budget friendly project for sure.